Our great country owes a lot to the brave men and women that serve it, most people are aware of this but some still turn a blind eye to veterans that are trying to adjust to life outside the military service. Our very own Joe Ouellette, like many heroes, did not hesitate when his country needed him during the Cold War. He served with honor and returned home knowing that his duty was not over. He was aware that the military is full of men and women that would be a great addition to companies like his; he just had to find a way to contact them and make them a part of his team. This is how he approached Show-Me Heroes, an initiative started by Governor Nixon in 2010. The Missouri Army National Guard and the Missouri Division of Workforce Development joined forces to help businesses find veterans that would not only bring their many skills into the workplace, but also the discipline, teamwork and resilience that were part of their military life. The organization held events and job fairs where OMS was able to meet and talk to veterans that were looking for employment. 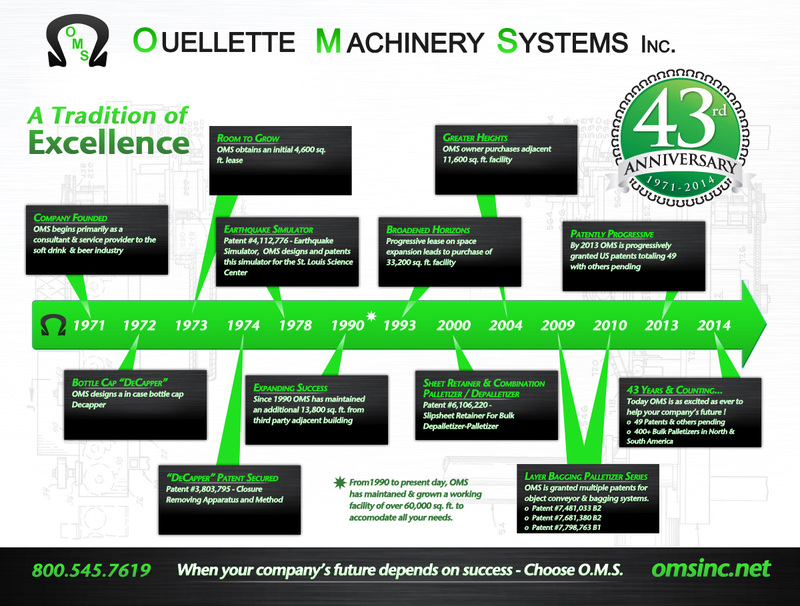 These events proved very successful and OMS was happy to hire those that had the skills and backgrounds necessary to work with the machinery that it manufactures. 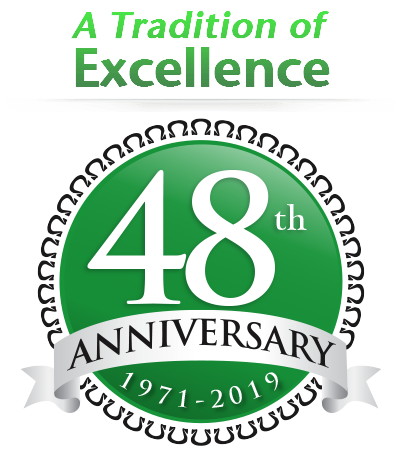 OMS has never looked back and recognizes that the veterans that have joined its ranks have made a great contribution to the company. Joe Ouellette was proud to welcome such valuable members of society and this very human act was recently acknowledged by Show-Me Heroes. Capt. Michelle Matthews presented him with the Flag of Freedom Award, a recognition earned by businessmen who hire men and women that have returned home after servicing the country. Receiving this award was a humbling experience. 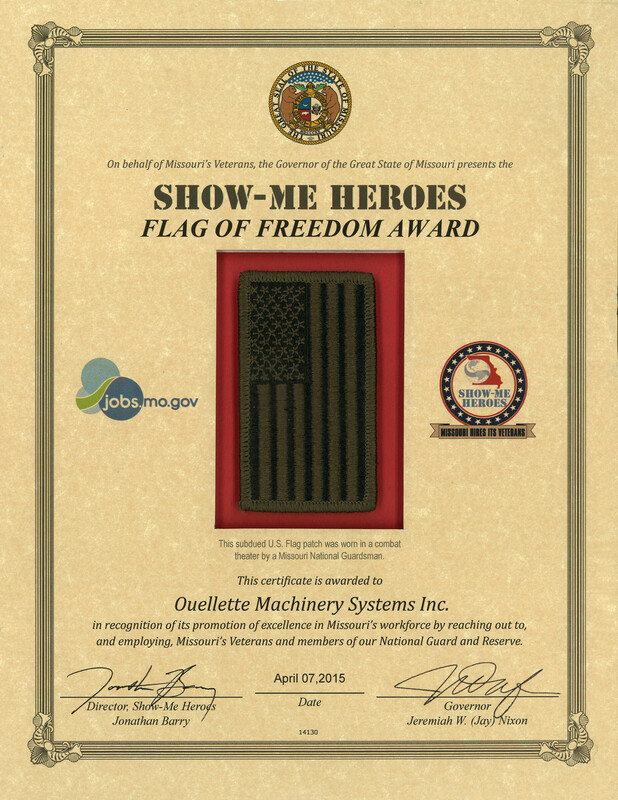 Joe Ouellette knows about the hardships of adapting to civilian life, and encourages other companies in Missouri and the rest of the country to join this initiative and help our veterans during this transition. Let us not take anything for granted and welcome them with open arms. After all, they are finally coming home.